I was really on top of my list last week…I even did some scrapbooking! I do have a few carry-overs this week, but nothing major. This week is going to be a little tougher because my allergies are terrible! 1. Deposit yard sale money…over half way to my laptop! 2. Inventory pantry & fridge. 3. Re-pot my pineapple tree. 4. Order more photos for scrapbook. 5. Locate scrapbooking supplies buried in the garage. 6. Play play-doh with Grayson. 8. Order photo shoot photos & finish up review post. 9. Discuss budget tweaks with Greg. 11. Get new and way cooler blog up and running…with my genius programmer husband’s help, of course. Would you like to join us this week for To-Do Tuesday? Start with just a few things. Don’t over-do it your first couple of times. You’ll grow to become a list-a-holic later, start small now, though, k? Just so you know, you can join us at anytime, it doesn’t have to be on Tuesdays – the list will go up every Tuesday for you to link to, but you can make your list and link to us at any point in the week! Remember, with “To-Do Tuesday”, we’re attacking our to-do lists each week, blogging about our lists and what we’ve got going on, and sharing it with each other to help keep each other accountable. Everyone should come back here to link up in the MckLinky as the central “To-Do Tuesday Hub” so we can visit who’s participating and offer encouragement to each other throughout the week. 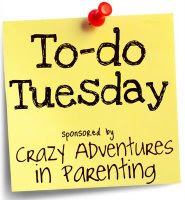 Don’t forget to add the “To-Do Tuesday” button to your post, linking back to this post! Let’s continue to cross items off our list as we go and help support each other in completing our lists! Don’t forget my useful HTML tutorial on how to effectively “cross-out” or √ “check off” your items on your to-do list! Joining us? We’re using a new linky alternative called MckLinky! Please add your link below (to your To Do Tuesday post, and not the main page of your blog). Cool! Lots of great things to do in St. Lou!